George Graham Reviews Duncan Sheik's "Daylight"
The music business, critics and indeed fans are wont to categorize performers into well-defined styles, which can often be very restricting to an artist. It has gotten to the point that different styles of music imply different lifestyles of the fans -- consider the difference between country and hip-hop. So eclectic performers, especially those who have enjoyed a degree of commercial success in one style, feel pressured to make more music in that particular genre. Otherwise the marketing department of the record labelwon't know what to do. Fortunately, there are those who resist the temptation to do the expected and follow up hits with similar music. 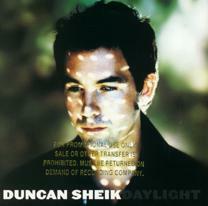 This week we have a good example, Duncan Sheik, whose new CD is called Daylight. A native of New Jersey, Duncan Sheik spent a lot of his youth in South Carolina, before attending Brown University, where he was involved with bands including one with Lisa Loeb, who would become successful in her own right. Sheik was eventually signed to a major record label and released an eponymous debut album in 1996 that spawned a pop hit called Barely Breathing which spent the better part of a year on the charts. Sheik created intelligent pop, not particularly lightweight, but hardly inconoclastic either. He followed that up in 1998 with a more band-oriented recording called Humming. Then in 2000, Sheik met playwright Steven Sater, who was creating a work called Umbrage. Sater had not previously composed music, but Sheik was intrigued by his lyrics, based in part on Buddist influence. Sheik set to music Sater's often-ruminating words, and also drew heavily on the influence of the late English singer-songwriter Nick Drake and to create Phantom Moon released in the spring of 2001. It was a brilliant record that defied any pop music stereotypes one might have had of Sheik. The mood was sometimes dark and melancholic, but the combination of the fascinating lyrics, the beautifully crafted, mostly acoustic arrangements, and Sheik's own dusky vocals made for an album that was not soon forgotten. It was interesting, that given the music industry's penchant for putting everything in little boxes, Sheik's usual pop music label did not release Phantom Moon, but instead it was issued on a some-time classical label. That also led to Sheik's composing music for the Public Theatre/New York Shakespeare Festival in the past year. Now Sheik is back with what his record label calls, apparently with some relief, a more pop-orieted album. Its title is Daylight, but it is hardly lightweight commercial fluff. The influences that came together on Sheik's Phantom Moon have had a lasting effect, and the new CD is probably more like Phantom Moon than his earlier more commercial recordings. Once again, there is a judiciously used string orchestra, the instrumentation is as much acoustic as it is electric, and the musical mood, even when the lyrics are more upbeat or conventional, continues to show the contemplative or even wistful sound of Phantom Moon. The result is another fine album that greatly transcends the boundaries of commercial pop, and has a lot of depth, while offering lyrics of a less philosophical bent that those created by Sater. This time Sheik shows a little influence by another of set of British performers from the 1960s, the Beatles, and more specifically George Harrison's material. Daylight was produced by Patrick Leonard, who has had his share of pop hits with the likes of Madonna and Elton John, but keeps this CD very tasteful. Guitarist Gerry Leonard, who was prominent on Phantom Moon is also present on Daylight, as is bassist Jeff Allen and drummer Doug Yowell, in this Los Angeles-area production, though the string orchestra was recorded in England. Also making an appearance on the CD is Homegrown Music veteran Neal Casal doing backing vocals on one track. The material is an interesting mix of the laid back and the more upbeat, sometimes within a single track. The writing is generally high in quality, with only one or two tracks that could be considered commercial compromises. Lyrically, Sheik mostly explores that age-old topic of relationships, though often from a distinctive perspective, including for example, coming across one's ex-girlfriend in the pages of a "girlie" magazine. And the influence of Sater's collaboration on Phantom Moon also finds its way into Daylight with titles like Such Reveries and Half-Life. Duncan Sheik, after making a journey from mainstream pop to fascinating contemplative music, had gone about halfway back to pop on his new CD Daylight. The songs reflect a dichotomy between the ethereal sound of his last album Phantom Moon and his previous more commercial material. But the balance is firmly in on the side of artistic integrity with a nice collection of literate, often very positive songs, with a tastefully handled musical setting that runs from orchestral to near mainstream pop. The musicianship is first-rate, Sheik remains an appealingly understated vocalist whose style well fits his more meditative moments, and the string arrangements, prove to be a particularly pleasant surprise in their effectiveness. Sonically, we'll give the album about a "B minus." While I like the intimate sound of Sheik's voice, as usual for a major label release, the sound is excessively compressed for loudness, undermining the ebb and flow of the music, and the overall mix is also a bit dull-sounding -- lacking in high frequency sparkle. It's nice that a performer of the musical calibre of Duncan Sheik can move from one genre to another -- hopefully without losing his credibility among his fans, who perhaps will find their horizons widened some. His new CD Daylight proves both his versatility and his continued artistic development.